Does your home consist of plain white walls devoid of decoration? Chances are, as soon as you moved into your it, you went to work choosing paint colors, artwork and other design elements that reflect your personal style. Maybe you hung posters or prints with motivational quotes to directly influence your outlook each day. Whatever decor you chose, you’re probably aware of the impact your personal environment has on you and your guests. While we tend to pay careful attention to the environment we create in our homes, we may fail to give the same attention to our workplaces, despite the fact that we spend almost just as many, if not more, waking hours there. Employees do often decorate their desks, but what about shared spaces like lounges, hallways, stairwells, conference rooms and more? A study by Cass Business School found that 64 percent of male respondents and 73 percent of female respondents agreed that their working day is affected by the design of their workplace. Younger workers, millennial’s in particular, are even more passionate about their work environment than previous generations. The fact is, companies do all of their employees and themselves a great service when they pay attention to visually enhancing their spaces, not just in terms of traditional decor but also through well-intentioned graphic design. This is where environmental graphics come in. Environmental graphics go by several names. They’re sometimes called supergraphics, experiential graphic design or shortened to EGD for environmental graphic design. Whatever you call it, environmental graphics are displays that enhance the environment where they appear. They can take the form of signage, banners, wall murals, elevator wraps, window graphics and more and can appear on doors, windows, walls, floors or ceilings. They can be flat, such as floor graphics, or three-dimensional, such as acrylic graphics. Whatever form they take, environmental graphics have some important benefits. EGD is a rising trend in the corporate world. It started primarily with cutting-edge technology companies, but today, companies of all kinds are embracing the trend. Far from a passing fad, this movement has resulted from an increased understanding of the significant impact the aesthetic aspect of environments has on people. Let’s look at seven important reasons to add environmental graphics to your business. One way environmental graphics are used that you might be more familiar with is in wayfinding signage. Navigational signs can be found out in public, around the outside of buildings and inside buildings. They help to indicate location. Imagine you’re at an airport trying to figure out where your gate is. You’ll likely see signs on the walls, hanging from the ceilings and maybe even on the floors indicating which direction you need to go and sometimes how far. Once you get there, you should see a sign indicating that you’ve arrived and can finally plop down into a chair and await boarding. You may even see a sign letting you know that there’s a charging station across the aisle. Though your office building may not be as big as an airport, you still probably have some signage to help with wayfinding. For instance, you may have signs that indicate a direction to the bathrooms, elevators, stairs and exits. These signs could be simple, framed pieces of paper with black text, but environmental graphic design can bring them to life. Imagine stepping out of an elevator and seeing a large, colorful number three directly in front of you on the wall. Maybe the number is composed of company photos or words that describe the valuable work done on the third floor. A sign like this is eye-catching, and it allows you to immediately feel a sense of place. While wayfinding fulfills an immediate practical need, environmental graphics don’t stop there. Another one of the reasons to add environmental graphics to your business is to help inform your employees of your company’s rich history. Whether your company is 150 or five years old, you have a story to tell, and it can be told in a visually stimulating way through environmental graphics. Even if your company’s roots and early days seem light years away from today, its history is an essential aspect of your current brand identity and ethos. Promoting awareness of your business’s history is an important way of building company culture and allowing employees to feel like a part of something bigger — perhaps even something that has impacted history. If your company is all about innovation, it will be inspiring to see how far you’ve come. These businesses sometimes choose to display their history as a timeline that moves upward as well as forward to indicate this spirit of progress. Another part of building company culture is instilling your company’s mission and values in all who interact with it. Your company’s purpose and core beliefs are spelled out in your mission statement and values, so these elements should be central fixtures in your workplace. But too often, these messages are out of sight and, therefore, out of mind. Polls from various companies continually indicate that most employees are unaware of their company’s mission and values, which is a real problem because it leaves employees feeling disconnected rather than engaged in an important purpose and culture. The 2018 “State of the American Workplace” report by Gallup found that one of the necessary elements for employees to be highly productive is “communication about their organization’s mission and purpose.” So, how can we communicate this information? Your company’s mission and values should be lived out in the work you do each day, so employees should already be implicitly aware of the purpose and principles that guide the work they do. However, it’s essential that you communicate these messages explicitly as well. Having your mission and values on your website isn’t enough. Environmental graphic design is a great way to keep your company’s guiding messages at the forefront. Think of your mission statement enlarged to cover a wall. Imagine every window in a conference room displaying one of your business’s core values. There are endless possibilities for displaying this information with environmental graphics. You don’t even need to limit yourself to only your mission statement and list of values. Why not also prominently display an inspirational quote from the founder of the company or the current CEO? The options are endless. A positive workplace culture isn’t just about company mission and values. The day-to-day experience employees have is largely dependent on the relationships they hold with other employees. 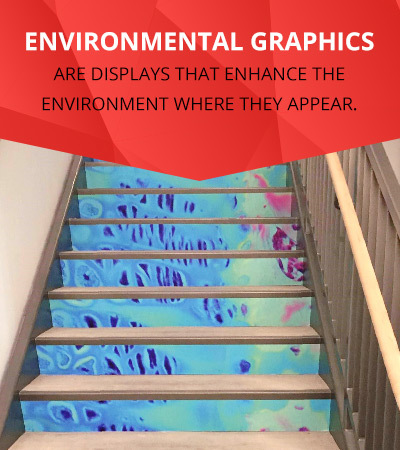 It may surprise you, but environmental graphics can play a role here too. Unfortunately, in one extensive study, only 58 percent of respondents believed their workplace environment contributed to a sense of community. Of these respondents, 84 percent reported feeling that it was an enjoyable environment to work in, indicating a significant correlation between an environment that fosters community and a pleasant environment. A Harvard University study focused on art in the workplace and revealed employees’ beliefs about the way art impacts their overall experience. Two of these reasons are that art promotes social interactions and facilitates personal connection-making. How does this process work? Think about your high school or college. You likely saw your school’s colors and mascot displayed in many different places. These visual elements reinforce school pride and a sense of shared community. The same is true in a workplace. You can increase brand identity with graphics. You may not have a mascot, but you probably have a logo. You likely also have colors and design elements associated with your brand. Boldly displaying these visuals around the workplace environment — a strategy known as environmental branding — causes employees to feel they can rally around a shared identity. Of course, employees are all individuals and should be celebrated for their diversity, but coming together over a shared identity that unites us is important too. It’s what community is all about. It turns out that when employees are in a more aesthetically pleasing work environment, they’re more productive. One study found that workers in spaces that were enriched with art or greenery were, on average, 17 percent more productive than those in lean spaces. This reason alone should be enough to prioritize the aesthetics of employees’ working environments. When employees’ minds are stimulated by vibrant visuals, they’re more likely to feel inspired. Artists aren’t the only people whose work requires creativity. No matter what field your business is in, your staff members must think critically to come up with creative innovations and solutions every day. The design choices you make can give you control over the vibe the workplace promotes. For example, colors are known to have certain effects on people’s thoughts and attitudes. In some cases, this effect can be negative. A University of Texas study found that offices that are gray, beige and white tend to cause employees to feel sad or depressed. This reaction was especially prevalent in women. Red: This color is known to increase heart rate. It’s associated with feelings of urgency, passion and aggression. Yellow: Yellow is a stimulating color commonly associated with happiness, freshness and energy. It’s also thought to promote creativity. Blue: This low-wavelength color is associated with calmness, peace and trust. It tends to promote focus as well. Green: Green is also a low-wavelength color, making it calming. It’s associated with nature and, in the West, financial prosperity. Promoting productivity and positivity will also have a positive effect on employees’ health. Businesses today understand just how important the health and well-being of their employees are. This importance is not only tied to a concern for employees but also associated with a business’s success. A company’s bottom line is very clearly affected by the health of its employees. Part of the way well-being is promoted with environmental graphic design is through the positivity it breeds, as we’ve seen. As positive feelings are promoted, negative feelings like stress go down. In a survey of 800 employees across various companies, 78 percent agreed that art in the workplace reduces stress. This effect is significant because stress can take a real toll on employees’ health and should, therefore, be actively prevented. Stress isn’t the only aspect of employee health that can be affected by environmental graphic design either. If you want to encourage better workplace health habits, you can do so through environmental graphics. For example, you could use an eye-catching graphic display to promote a wellness program you have going on. You can also visually enhance the stairwell — a space that tends to be completely blank and boring — in order to motivate able employees to take the stairs instead of the elevator. So far, we’ve focused on the benefits of environmental graphics for employees, but what about consumers? After all, if your workplace also serves as a storefront or office where consumers can visit your business, we should consider them too. Just as you want to present your company’s brand identity, values and positivity to employees, you want to share these features with consumers. Let visitors know what you’re all about. When a potential client or customer walks up to your building or through your door, they should immediately have a positive impression of the work you do. This need may seem like a tall order, but people are visual creatures, so we’re naturally inclined to be captivated by graphic displays and allow them to leave an impression on us. This fact doesn’t mean you need to bombard consumers with overwhelming displays. Through clean, simple, engaging text and visuals, you can create a positive impression and communicate volumes about all that your company has to offer. If you’re ready to begin enhancing your company’s office space or storefront with environmental graphics, SpeedPro can help bring your vision to life. We’re a national brand with over 20 years of experience in the industry, and we specialize in a variety of printed products, including large-format graphics. We’re dedicated to excellence in all that we do. You can expect us to deliver work on time and meet or exceed your expectations for quality. Our nationwide network of over 120 studios upholds our high standards no matter where you’re located. Browse through some examples of environmental graphic displays to get inspired and see what kind of work we do. Find a SpeedPro studio near you to request a quote, and begin reaping the many benefits of environmental graphic design in your company.